With the creek running near our site, I actually slept pretty hard last night. I slept all the way through, which never happens and somehow didn’t need to delayer. I was so chilled from the cold wet day of hiking yesterday that I had worn almost all my clothes to bed. It was near freezing overnight. I wore my wool pjs, hiking pants, hiking t shirt, down jacket, rain jacket, buff, beanie, both hoods of my jacket over my head, sleep socks, and gloves on…and didn’t remove any of it all night. Since today was a lot of miles to town, and mostly downhill, E decided she’d get up early and I could catch up since I tend to cruise downhills. I left camp at 6:35am and and she left at 5:55am. It was just barley above freezing, but at least it was dryer than it’s been. I wore my rain pants with my hiking pants underneath and ended up keeping them both on most of the day. We agreed to meet at a trailhead about 18mi/29km into the day. 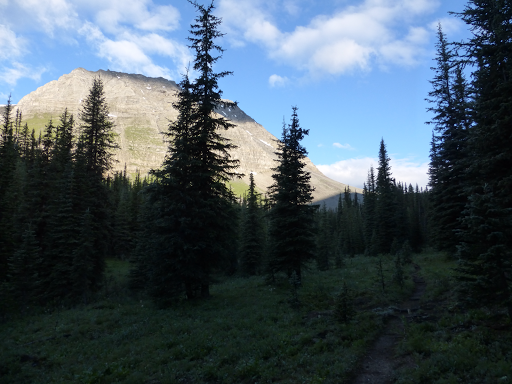 The morning thankfully started with a gradual climb up to Goodsir Pass and I was sooo excited to see sunlight on a mountain when I broke out of the forested climb! 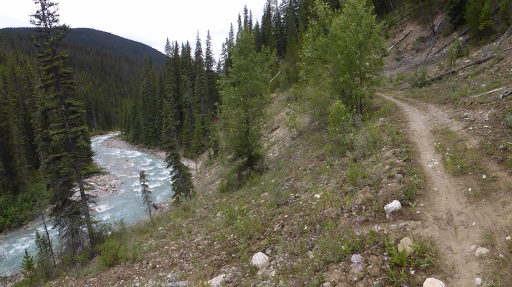 For about a mile, the trail goes along a grand range and I was totally pumped. 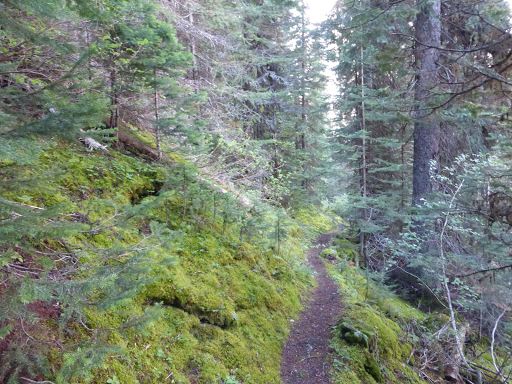 Then the trail started to descend and went into the forest for the rest of the day…dang! It stayed cool all day as the clouds returned for the day. I could get glimpses of the range every so often and it was a bummer to be so close and not see the views just on the other side of the trees. Good news of the day was that most of the path was clear trail! So glorious and perfect for the downhill cruising I like to do. 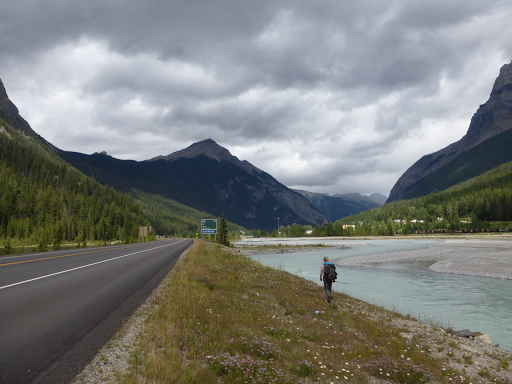 With a light pack heading into town, who could resist jogging down this gradual grade!? At one point, the trail joined the Ottertail River Trail and followed an old fire road that paralleled the river, which is a cool teal color. Very easy hiking and more good downhill cruising. 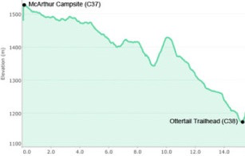 I didn’t see anyone until around noon when I saw some mountain bikers and then two men who had camped a couple nights and were headed to the same trailhead we were. 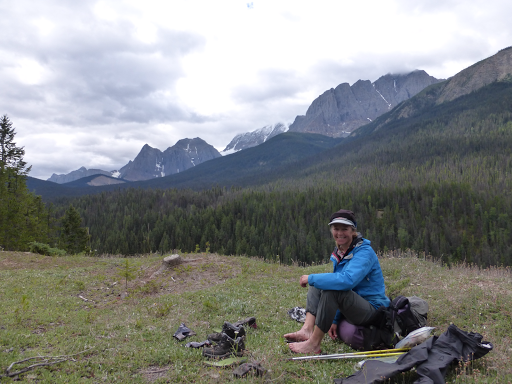 Then, just a mile before the trailhead, I caught up to E who was sitting down for lunch. Perfect timing. We’re gettin’ the hang of this! I had expected E to be eating at the trailhead by the highway, but she grabbed up this much more scenic and enjoyable spot. Great choice! 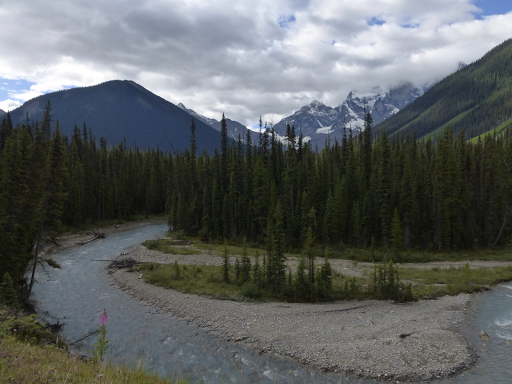 As we approached Field along Hwy 1, we could see it across the Kicking Horse River. 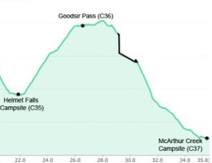 Somehow we did 26mi/41km by 4pm today…we thought the mileage must be listed wrong, but totaling the hours hiked, if we hiked just under 3mi/hr, it’s possible, and with all the downhill, maybe we did. We’ll take it! Field is a very cute little village of a town that seems to make a good chunk of its profits from tourists. 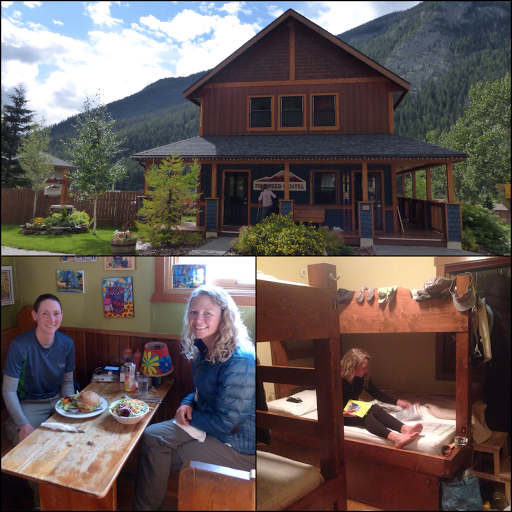 We checked into the Fireweed Hostel, which is comfy, quiet, and clean. 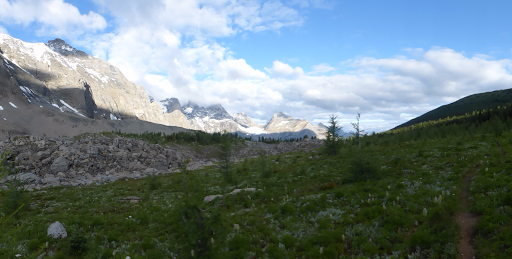 We are not sure it’s the best deal (lots of options), but it seemed to be the place other hikers used. It was a good price and would be about $27US each. We wanted our own room and booked a four person room for both of us for $54US each. We had to go to the lodge down the street for laundry and the wifi is too slow for my patience, so I’m just using my Telus data and am SO GLAD I went that route with the phone plan. There are two restaurants in town, no grocery store, and a gas station.. For dinner, we went to The Siding Cafe and it was great. E’s hiker hunger has set in and it’s fun to not be the only one eating so much. We may both get double breakfast tomorrow at the fancy place in town, The Truffle Pigs. We have a half day coming out of town tomorrow, so it will be nice to have a relaxed morning. Best news of the day is that my InReach is back up and working again! Apparently, this is a common glitch and there is a soft reset of holding the x button and the down button simultaneously for 60sec and then powering it up. Totally worked! THANK YOU to Bill for looking that up and letting me know! 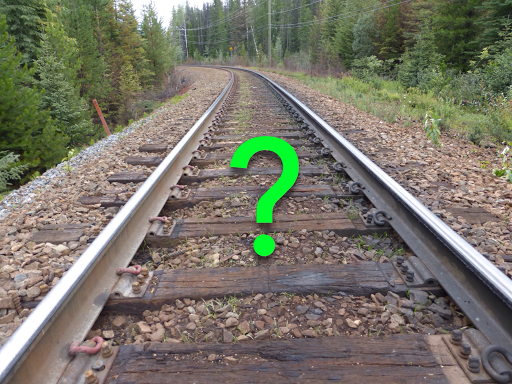 Also, a warning that this next stretch may be so remote that I won’t post again for a week or so. No worries.